This “how-to” will help you set up a Guralp 3T instrument and DM24 digitiser in a seismic vault, with (optionally) an EAM to connect them to a local computer network. the calibration and installation sheet. You may also have ordered and received an optional Hand-held Control Unit (HCU) for monitoring sensor outputs and calibration. two accurate orientation pins on the instrument’s base-plate (one brass and one steel). The sensor’s serial number is stamped onto the side of the sensor base, next to the N/S indicator. It can also be found on the label on the top lid of the sensor. You should quote this serial number if you need assistance from Guralp Systems. The 3T is a sensitive instrument, and is easily damaged if mishandled. If you are at all unsure about the handling or installation of the device, you should contact Guralp Systems for assistance. Do not bump or jolt any part of the sensor when handling or unpacking. Do not kink or walk on the data cable (especially on rough surfaces such as gravel), nor allow it to bear the weight of the sensor. Do not move the instrument whilst the masses are unlocked. You should report to Guralp Systems any sign of loose components or any sound of parts moving inside the instrument. Do not connect the instrument to power sources except where instructed. Do not ground any of the signal lines from the sensor. 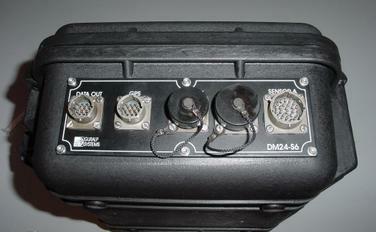 The instrument itself has a single connector, which can be joined to the optional breakout box using the cable provided. Individually shielded twisted-pair cabling must be used for the sensor outputs, control lines and power supply. If you need to make up a suitable cable, you should confirm the cable type with Guralp Systems. The power supply can be connected either directly to the breakout box or, if a digitiser is connected, to the digitiser: the digitiser will supply power to the breakout box and onwards to the sensor. You can use the breakout box to centre, lock and unlock the sensor masses. To unlock the sensor masses, press the ENABLE and UNLOCK buttons simultaneously for seven seconds. The BUSY LED will light when the instruction has been registered. All three masses are unlocked, each in turn. The sensor then automatically moves on to centre the masses, during which time the BUSY LED will flash. When the BUSY LED goes out, the instrument is ready for use.You should not attempt to move the instrument without re-locking the masses. To lock the sensor masses, press the ENABLE and LOCK buttons for seven seconds. The BUSY LED will light when the instruction has been registered. When the BUSY LED goes out, the instrument is ready for transportation. To re-centre the sensor masses, press the ENABLE and CENTRE buttons for seven seconds. The BUSY LED will light when the instruction has been registered. When the BUSY LED stops flashing, the centring process has finished. You may need to initiate several rounds of centring before the instrument is ready; when no more centring is required, pressing the ENABLE and CENTRE buttons has no effect. The sensor requires a DC power supply of between 12 and 36 Volts, which it obtains through the socket from the digitiser or breakout box. If using the optional breakout box, you will need to make up a suitable cable to connect your power source to the 10-pin connector on the breakout box (spare 10-pin mil-spec connectors are provided for this purpose). 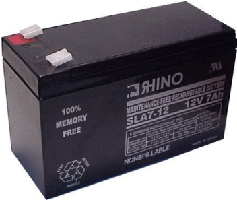 Using a 12 V, 25 Ah sealed heavy-duty lead-acid battery, you should expect the instrument to operate for around a week without recharging. installations may be required in remote locations, or otherwise in circumstances where it is unfeasible to build a vault. using as little extra mass as possible in preparing the chamber. vibration caused by heavy machinery (even at a distance), or by overhead power lines. This can be done by selecting a suitable site, and placing the instrument in a protective enclosure. An open-sided box of 5 cm expanded polystyrene slabs, placed over the instrument and taped down to exclude draughts, makes an excellent thermal shield. After installation, the instrument case and mounting surface will slowly return to the local temperature, and settle in their positions. This will take around four hours from the time installation is completed. If you require long-period recording, you should re-zero the instrument after this time. Unpack the sensors from their container, saving the shipping boxes for later transportation. Prepare the mounting surface, which should be smooth and free of cracks. Remove any loose particles or dust, and any pieces of loose surfacing. This ensures good contact between the instrument’s feet and the surface. If it is not already present, inscribe an accurate North-South line on the mounting surface. Place the sensor over the scribed line, so that the brass and steel pointers are aligned with the marked directions, with the brass pointer facing North. 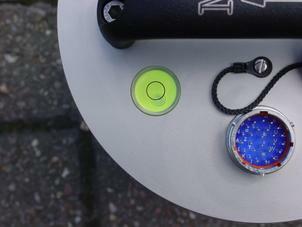 This can be done by rotating the base of the sensor whilst observing it from above. The brass pointer can be found next to one of the feet. If you cannot easily see the pointers, you should align the sensor using the north arrow on the handle. However, the alignment of the handle with the sensors inside is less accurate than the metal pointers, so they should be used wherever possible. The top panel of the 3T includes a bubble level. Level the sensor by adjusting each of the three feet of the instrument in turn, until the bubble in the bubble level lies entirely within the inner circle. (The instrument can operate with up to 2 ° of tilt, but with reduced performance. )To adjust the height of a foot, loosen the brass locking nut and screw the foot either in or out. When you are happy with the height, tighten the brass locking nut downwards to secure the foot. Gently check the foot to ensure that it is locked. Connect the sensor to the breakout box, or a Guralp digitiser if you are using one.The remainder of these instructions assume you are using a breakout box. The Guralp DM24 digitiser allows you to access all the functions of the seismometer through the digitiser instead; you should refer to its documentation for more details. Connect a 12-36 V power supply through the breakout box.Note:You must ensure that the polarity is correct before turning on the power. The red cable must attach to the positive supply line and the black cable to the negative supply line. Unlock the sensor by pressing the ENABLE and UNLOCK buttons on the breakout box together. Wait for the BUSY LED to start flashing, and then go out.Never move the instrument while it is unlocked. Serious damage to the internal components can occur. 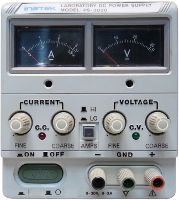 Check the mass position outputs using a digital multimeter, digitiser or the hand-held control units. If required, re-centre the masses by pressing the ENABLE and CENTRE buttons on the breakout box together. 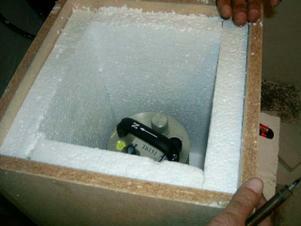 Lock the instrument again, then cover it with thermal insulation (for example, a 5 cm expanded polystyrene box). This will shield it from thermal fluctuations and convection currents in the vault. It also helps to stratify the air in the seismometer package. Position the thermal insulation carefully so that it does not touch the sensor package. Ensure that the sensor cable is loose and that it exits the seismometer enclosure at the base of the instrument. This will prevent vibrations from being inadvertently transmitted along the cable. Unlock the instrument again, once all danger of accidental contact is finished. 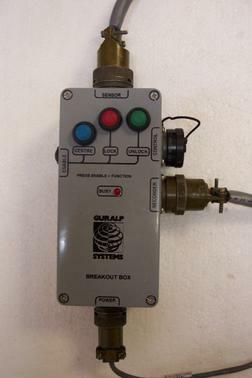 Connect Guralp seismometers to the SENSOR A and SENSOR B ports as necessary, using the data cables provided with the instruments. 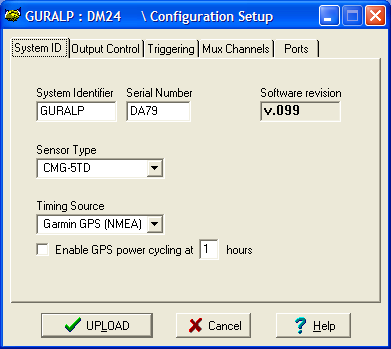 Connect a GPS unit to the GPS port. If you are using a third-party GPS, you will need to make up a serial cable ending in a 10-pin mil-spec socket. If you are using an EAM, connect the DATA OUT port to the straight-through cable from the EAM. Otherwise, connect a Guralp combined serial/power cable to the DATA OUT port. Make up a connector if necessary, and attach the power lines to a 12-28 V DC power supply. Note:You must ensure that the polarity is correct before turning on the power. The red cable must attach to the positive supply line and the black cable to the negative supply line. Connect the 9-pin serial socket to your computer. The digitiser will start up automatically as soon as it is provided with power. 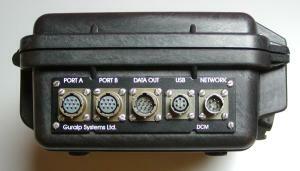 Connect Guralp digitisers or digital instruments to PORT A and PORT B as necessary, using the serial data cable provided. Connect a Guralp combined serial/power cable to the DATA OUT port. Make up a connector if necessary, and attach the power lines to a 12-28 V DC power supply.Connect the 9-pin serial socket to a computer for configuration. You should change the password as soon as you can with the command passwd. In the first command, eam-CIDR-address is the IP address you want the EAM to use (e.g. 192.168.0.100) followed by a forward-slash character (/) and the number of network bits in the specified address (usually 24, so 192.168.0.100/24). This method of specifying both address and netmask simultaneously is known as CIDR (Classless Inter-Domain Routing). For more information, please see this description. 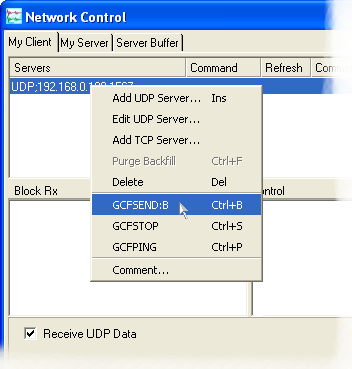 In the second command, network-gateway is the IP address of the gateway computer (e.g. 192.168.0.1). Note: These settings will only persist until the EAM is rebooted. To permanently change the EAM’s configuration, please see the EAM manual. You can now configure the EAM and attached digitisers over the web interface. You can connect to the EAM’s command line over the network at any time using SSH. The EAM is not visible in Scream!, because data streams pass through it transparently. You can control attached digitisers and instruments over the link, through any number of intervening EAMs. The easiest way to retrieve data from the EAM is to remove the internal hard disk, and attach it to any computer supporting either Firewire or the USB Mass Storage Protocol. It will appear on the computer as an extra hard drive. To retrieve data from the EAM over HTTP (or HTTPS), log in to its web interface and click Removable Disk from the tools menu. Use the interactive filesystem browser to locate the file you want to download and then simply click the associated “download” button. You can configure the installation directly using Scream!, by connecting the serial port of a computer to the DATA port of the digitiser. Start Scream!, and wait for the digitiser to be shown in the main window. Right-click on the digitiser’s icon and click Configure…. Change the System Identifier to a unique value for this installation, and select the sensor type you are using. 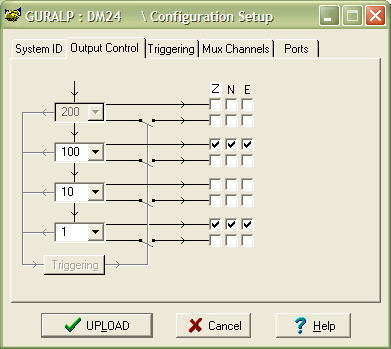 Click on the Output Control tab to display a tap diagram.Guralp digitisers have four output stages, called taps, which represent successive decimation filters being applied to the incoming data. Each decimation filter divides the sample rate by a factor of 2, 4, 5 or 10 and the outputs from any of the stages are available for monitoring and/or storage. Use the menu boxes on the left to choose the desired configuration. In this example, we will use 200 →100 →10 →1. Next to the 100 samples/s tap, check the Z, N and E boxes in the top row. This makes the digitiser produce data constantly at 100 samples/s. Next to the 1 sample/s tap, check the Z, N and E boxes in the top row. If you need to change any of the other settings in the Configuration Setup window, do so now. Click UPLOAD, and wait for Scream! to pass the new configuration to the digitiser and reboot it. This will take about 30 seconds. When the digitiser is back on-line, return to the main window, right-click on the digitiser’s icon and click Control…. 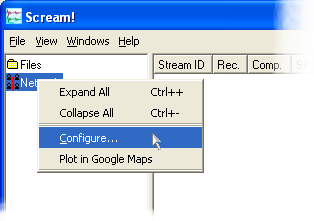 Click on the Data Flow tab to display the window shown above. Select Direct for the Transmission Mode. (The Buffering setting may be ignored. )In direct mode, the digitiser will send all the data it produces directly out through its DATA port to Scream!, using the Guralp Block Recovery Protocol (BRP). Click Apply to send the instructions to the digitiser. The installation is now active. 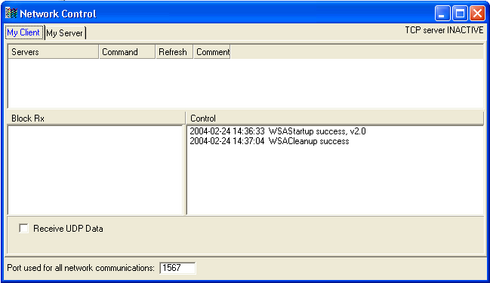 by sending commands to it from the EAM’s console. If the EAM is connected to your computer through a direct serial link, it will automatically forward any data it receives through PORT A or PORT B. As soon as Scream! receives data, whether over the network or a direct serial connection, the digitiser will appear in the main window, and you can configure it as above. The EAM can act as a GCF server on your network, which Scream! can connect to. By default, the server is active and configured to forward all received GCF data on port 1567. This opens the Network Control window. 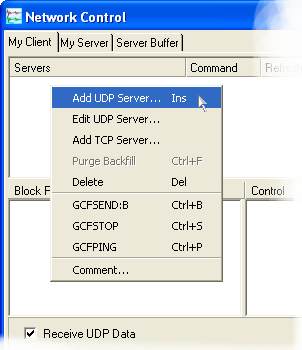 In the My Client tab, right-click in the space beneath Servers in the upper panel and select Add UDP server… from the pop-up menu. Click OK. The server should appear in the list under Servers. Right-click on the EAM’s entry in the list, and choose GCFSEND:B to instruct the EAM to begin sending data. The EAM, and any attached instruments, should now appear in Scream’s main window. You can now configure these instruments inside Scream! (see above) or view data as required. If you prefer, you can change the configuration of the digitiser from the EAM’s on-board web server without using Scream!. At the bottom of the menu tree on the left, under Configuration → System setup, the EAM lists all its connected digitisers. Click on the entry corresponding to the digitiser you have connected. Scroll down to the table displaying the output configuration of the sensor. The bottom row of the table allows selection of sample rate, constrained by the selection on the row above and the available divisors (2, 4, 5 or 10). To change the sample rate of any row other the bottom row, delete the rows below it. Check the boxes for each component in each “Continuous” row to enable output at that sample rate. If you need to change any of the other settings in this window, do so now. Scroll to the bottom of the page and click Submit and reboot digitiser and wait for the EAM to pass the new configuration to the digitiser and reboot it. This will take about 30 seconds.